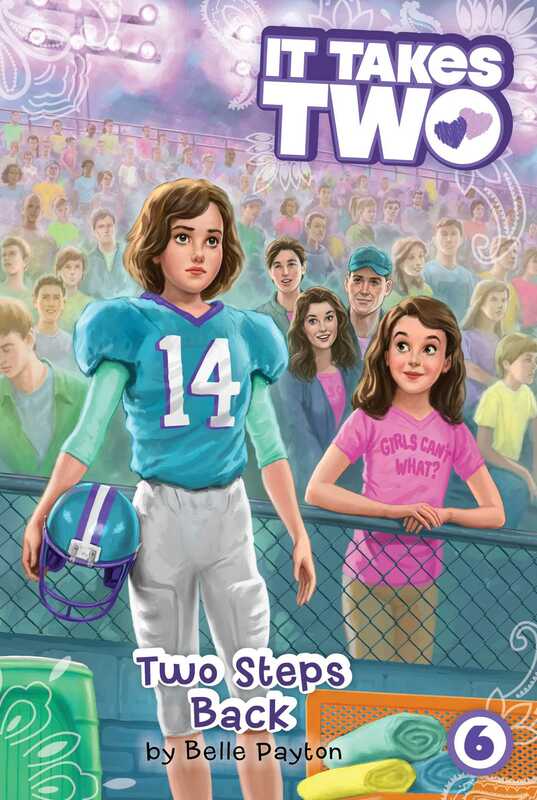 A rival football team refuses to play against Ava—and her twin wants to cover the story for the local news in the sixth book of the It Takes Two series! Alex is thrilled when she finds out she’s won a young reporters contest to produce her own piece on the local news. What a great thing to add to her resume...and what a great way to show her crush, high schooler Luke Grabowski, that she’s super mature for her age. She’s on the prowl for a juicy story when one pops up right under her nose: the Tiger Cubs’ biggest rival is refusing to play football against her twin! Ava’s conflicted: should she let her team stand by her and refuse to play, or should she spend this game on the bench? She doesn’t quite know what to do, but she does know one thing: she’s not interested in being the subject of Alex’s news story! Is Alex willing to give up her big scoop to support her sister? “Hello? Yes, this is Alexandra Sackett.” Alex put her hand to her right ear to muffle the sounds of the food court. “Yes. I—I did? I did? Oh my gosh, thank you! Yes! Yes! Yes, I will! Thank you! Bye!” She clicked off her phone and stared at it in disbelief. Alex beamed at her friend. She loved that Emily seemed so genuinely happy for her, and it was fun to hear Emily’s enthusiastic words in her pretty Texan drawl. Ever since Emily’s best friend, Lindsey Davis, had started spending most of her time with her boyfriend, Alex and Emily had grown even closer. Emily leaped out of her chair and came around the table to give Alex a big congratulatory hug. “What are we celebrating?” asked a voice behind them. Alex slackened her grip on Emily and turned to see who it was. She gasped with surprise. Luke Grabowski was standing right there between their table and the smoothie counter. He looked impossibly gorgeous in a faded black T-shirt and khaki shorts. Behind him were two of his friends that Alex didn’t know. The three of them were holding paper cups from a fancy coffee place across the way, and Luke had a book under one arm. Of course he has a book with him, Alex thought. He was not just beautiful; he was also smart. And funny. And nice. In short, perfect. Luke was her twin sister Ava’s tutor. Alex had had a crush on him from the moment she’d first met him, but no one in the world knew it, she was positive. Well, except maybe Emily and Lindsey, because she might have mentioned to them that she had been talking to a high school boy—she couldn’t help gushing a little! “Oh, hi!” she said, but her voice came out all squeaky. She didn’t dare look into his gorgeous blue eyes, so instead she focused her gaze on the coffee he was holding. Drinking coffee was such a high school thing. She’d never really liked it much, but she immediately resolved to add “try coffee again” to her to-do list. Alex giggled. She raised her eyes to look at Luke, and then quickly looked away, overcome with bashfulness. She wasn’t usually at a loss for words. On the contrary, Ava often told her she talked way too much and too quickly, but there was something about being in the presence of a crush that made her shy and awkward. And Luke was simply too handsome to look at for too long. It was like staring at the sun or something. But she recovered enough to introduce Emily. “Nice to meet you, Emily,” Luke said, his voice as smooth as melted chocolate. “And this is Pete, and that’s Brandon. We were just loading up on caffeine before we hit the books.” He held up his cup of coffee. “But tell us what the big celebration is all about,” he said. “Oh, ha-ha,” said Alex. “It’s no big deal.” She tried not to blush, although she knew she must be turning the same shade as Emily’s smoothie. “Wow!” said Luke. He put an arm around Alex’s shoulder and gave her a little squeeze. She gulped. Alex felt herself flush even more deeply. She couldn’t think of a thing to say, but she knew that it was her turn to speak. Her eyes landed on Luke’s coffee. “So, um, how’s your coffee?” she asked. Lame, lame, lame. What a dumb, stupid, idiotic question. “I love pumpkin spice!” said Alex quickly, and then mentally kicked herself. What if he thought that was babyish or something? “Thanks!” said Alex. Say something, say anything, keep the conversation going. “So, are you enjoying the book you’re reading?” she asked. “What book? Oh, this?” He held it up for them to see the cover. The title was Circuitry. Alex had no clue what circuitry was. “It’s scintillating,” said Luke with a grin. Scintillating. He had such a huge vocabulary! And obviously he loved circuitry, whatever that was. Alex made a mental note to study up on the subject. And he and his friends ambled off. Alex set the coffee down on the table and then fell into her chair. She stared at Emily. “That was Ava’s tutor,” she said. “Does everyone at Ashland Middle School go with a date?” asked Alex. She still felt like a newcomer to the school. She’d moved here to Ashland, Texas, from Boston with her family this past July. As if Alex needed to be told that! She’d had a tiny crush on Corey O’Sullivan, Lindsey’s boyfriend, a while ago, but she was definitely over that. “How do their parents feel about their getting back together?” asked Alex. Lindsey’s and Corey’s parents had gone into the restaurant business together and had had a falling-out last year. “I think they’re fine now,” said Emily. “They seem to have reached a shaky truce. And business at Lindsey’s family’s restaurant has picked up ever since the health department cited the chain across the street from them for health code violations. Hey. You listening?” Emily waved a hand in front of Alex’s face. Alex snapped back to attention. “Sorry,” she said. “I was just thinking about Luke. It was really nice of him to give me his coffee. He could have returned it and gotten another one.” She took a sip of the coffee and wrinkled her nose. “Well, he definitely seems to like you,” said Emily, taking a noisy last slurp of her smoothie. “Oh, no, he’s just nice like that to everyone,” said Alex casually. But inside, her hopes soared. Did Emily mean he seemed to like like her? Could he possibly be interested in her? Sure he was in high school, but he was a sophomore. That was only three grades higher than hers. In the excitement of running into Luke, Alex had temporarily forgotten about that. Winning the contest and having a high school boy possibly harbor a secret crush on her—this was definitely the best day ever!